President Hollande looked stunned after a shot rang out during his speech today in Lillognon. A police sniper shot two people during the Socialist president’s speech. 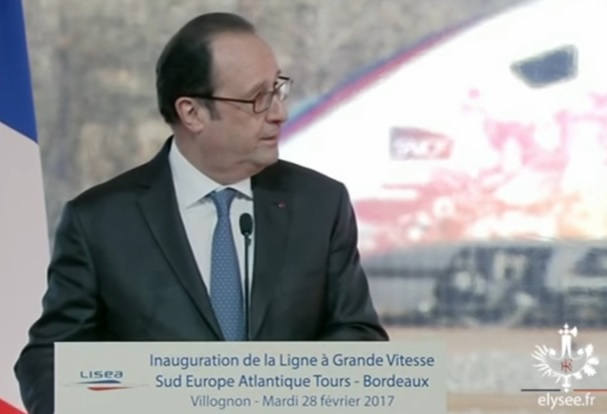 The President was speaking at the opening of the Paris-Bordeaux high-speed line at Villognon (Charente). His address was broken off when a gun was fired somewhere in the crowd. Mr Hollande, who will step down as President in May, raised a hand as he paused to look over in the direction of the discharged weapon. Seconds later, he carried on with his speech. According to local media a security guard accidentally fired his weapon after leaving his safety off.